Renting a houseboat to live on would seem like a useful alternative to buying a boat outright, especially for those that are either unsure whether or not boat living is for them although they’re still attracted enough to the idea of, at least, wanting to try the lifestyle for a while with the idea of buying a boat later if they take to life on the water. Alternatively, some people may have definitely decided that they want to live on a boat but cannot afford to buy one outright or cannot raise the money through a mortgage or loan for whatever reason. Unlike the housing market where getting a place to rent is rarely a problem, renting a boat to live on is not as simple as you might think. One of the main reasons for this is that people who tend to buy boats do so because they want to live on them themselves. Those who do buy one as an investment tend to only rent them out over the short-term as a holiday boat rental, for example where, especially in the summer months, they can charge a premium rate for doing so. That’s not to say that it’s impossible to find a boat rental for a longer-term and the internet is probably one of the best places to look. You may have to do a bit of delving around but there are many sites devoted to boat living in general some of which will contain forums or message boards where boating enthusiasts can exchange information and you may just get lucky and come across somebody who’s looking to rent out their boat on a medium to long term basis. Otherwise, you could be proactive and post a message on the forum or message board, stating that you’re looking to rent for at least ‘X’ amount of months and the specifics of what you’re looking for and you might find somebody gets back to you who can help or posts a response on the forum. Boating magazines will also contain classified ads so you may want to keep checking those or placing an ad yourself. If you do get lucky and have the opportunity to rent a boat for living on it’s important that you establish certain issues. Firstly, you’ll need to make sure that the boat comes with residential mooring rights as many mooring agreements prevent boat owners from letting their boat. If all the paperwork is in order in that regard, you’ll also need to find out whether or not you’re liable for council tax. The chances are you will be liable with a residential mooring so don’t simply assume that because you’re living afloat with no residential ‘address’ as such that you’re exempt from council tax as you’re likely to end up in trouble with the local authority. If you’re eligible, however, and you’re able to obtain a live aboard rental, you’d still be able to claim the likes of housing benefit to cover the full or partial cost of the rental, the mooring costs and the boat licence. You should normally be looking to obtain a common law tenancy and it’s crucial that you carefully read through any tenancy agreement first. These will obviously differ depending on the boat’s owner but things like security deposits, liability issues if there is any damage to the boat, your responsibilities regarding any general maintenance and who’s responsible for what as well as the length of the tenancy are all issues you’d need to look at carefully. Be prepared to hunt around, however, and to be both patient and pro-active in your approach as residential boat lettings are not as common as you might think. 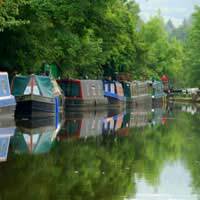 Hi I’m looking for narrow boat rental in and close as possible to the Leeds area. Small budget due to minimum wage and part-time student (mature) just looking for somewhere I can start a new life after a bad break up. Many thanks, matt. My partner and I are looking to rent a houseboat for at least 12-24 months, preferably Windsor, Staines and surrounding areas. We have two very small house trained pooches and we are both employed full time. Ideally a barge/pontoon/yoghurt pot but will consider a narrowboat. Hope someone can help ?? Hi! Interested in renting a canal boat in Scotland for 6 months and hopefully longer if all goes well. Please contact me if you have one available! hI guys, does anyone know someone who wants to rent a boat long term in manchester, cheshire or surrounding arears? I’m looking to rent a houseboat, canal boat or narrow boat for at least 6 months near the Manchester, Warrington or Wigan area ASAP as my landlord is selling his property. If anybody knows of any please email me..
I’m looking to rent a boat in the midlands area. I have a well behaved 2 year old French Bulldog. No kids. I’m a professional with the nhs. Long term rent with moorings essential. Does anyone know of where I could rent a houseboat in kent for January and February possibly longer.thanks Steve. I work 2 days per week at Edge Hill University but live in Wales. I have to stay 2 nights per week (Tues, Wed) in the area and would like to investigate the costs of staying on a boat in the area of Ormskirk, Burscough, parbold. I use public transport so would need to be really close or on a train/bus route.I would be prepared to commit to several months stay over the winter months.I am 63 and female. looking to rent to love long termor buy to let , im single no pets 42 felmale lived I glossop 8 years . Would really love to live and own a barge. Plus could me homeless in four weeks from Know .not looking for private housing or council thanks Sylvia ?? Hello We are retired and looking to rent a narrow boat longer term 1-6 months. I lived on my own 50ft narrowboat for 12 years so knowledgable and confident about the working and handling of a boat... but now I have more time would love to repeat the experience and live the magical life even for just a while. Living in our flat we miss the life afloat. Can you help please? Hi Hester I am considering the option you offer What are the fees ? Interested in long term boat rental up to 1 year in Berkshire area.I am considering buying a boat as my home due to expensive house prices in area but want to first understand and experience boat life. I am able to afford 550pcm but this is inclusive of all bills may be able to stretch but depends on what is included.Hope to hear soon.